(15/P1) TRENTON – The Department of Environmental Protection’s Green Acres Program has negotiated a $3.1 million purchase of 1,500 acres of pristine watershed buffer land from Jersey City, providing permanent protection to land that surrounds the city’s Split Rock Reservoir located primarily in Morris County’s Rockaway Township, Commissioner Bob Martin announced today. Under terms of the agreement that were finalized on December 31, Jersey City will retain water rights, via a permit from DEP, to continue to use water resources from Split Rock Reservoir, which is a water supply source for the city’s water system. The city also will retain ownership, use and maintenance of the Split Rock dam and the road leading to the dam. The state will have access to the road and to the reservoir. The preserved tract is a greenway connector, linking the state’s Wildcat Ridge Wildlife Management Area, Farny State Park, and Buck Mountain. The land is primarily forested, with hiking trails and fishing access, and includes a wide range of plant and animal species –including threatened and endangered species. The DEP has long held a conservation easement on nearly all of the 1,500 acres, dating back to 1996, which has offered a level of protection for the land. With this acquisition, the state will obtain full ownership of the property, allowing for public enjoyment of the site’s recreation and conservation resources. Split Rock Reservoir and surrounding watershed lands represent a unique natural resource, supporting a wide variety of endangered plants and animals, including the Indiana bat, bobcat, timber rattlesnake, northern goshawk, red-shouldered hawk, and the golden-winged warbler. 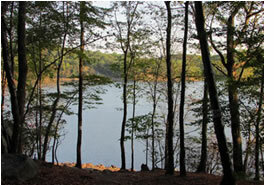 Black bears and white-tailed deer are common in the woodlands surrounding the reservoir. Splitrock Reservoir itself supports bald eagles and a wide variety of waterfowl during migration, including wood duck, ruddy duck, bufflehead and common mergansers. The reservoir boasts an excellent fishery for smallmouth and largemouth bass, chain pickerel and black crappie. The large contiguous forested blocks of land surrounding the reservoir, and filled with excellent trails, provides outstanding opportunities for birding, particularly during migration. Species of special concern such as the solitary vireo, Canada warbler and broad-winged hawk can be seen and/or heard regularly in the parcel’s woodlands. Aesthetically, there are few places in New Jersey, in which the public can enjoy outdoor recreation, that rival this area for its pristine natural beauty.